The new 11-member Prince George’s County Council was sworn into office by Clerk of the Court Mahasin El Amin, during the County’s 13th Inaugural Ceremony, held Monday, December 3, 2018 at the Showplace Arena in Upper Marlboro. In an historic inauguration, the County’s first woman County Executive, Angela Alsobrooks, also took the Oath of Office. For the first time since 1982, the Council includes two voter-approved At-Large Members, expanding the legislative body from nine to 11 members. Council Member Mel Franklin and Council Member Calvin Hawkins, II will serve four-year terms in the At-Large seats. Council Member Franklin previously represented District 9 on the County Council from 2010 to 2018. Council Member Thomas Dernoga (D) – District 1, returned to the County Council to serve a four-year term after the November 2018 General Election. He previously served as the Council Member representing District 1, from 2002 to 2010. Members serving their first terms as a Council Member include: Jolene Ivey (D) – District 5; Rodney Streeter (D) – District 7, Monique Anderson (D) – District 8 and Sydney Harrison (D) – District 9. Council Members Dannielle Glaros (D) – District 3; Todd M. Turner (D) – District 4; Deni Taveras (D) – District 2, and Derrick Leon Davis (D) – District 6 are serving their second terms in office. 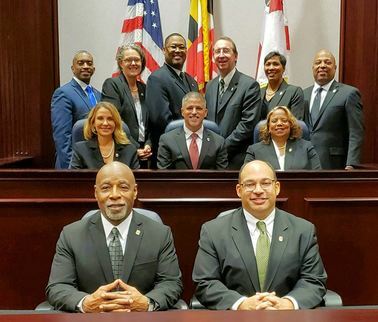 The newly-elected 11-member County Council convened for the first time, on Tuesday, December 4, 2018, to Exchange the Gavel and elect new Council leadership. 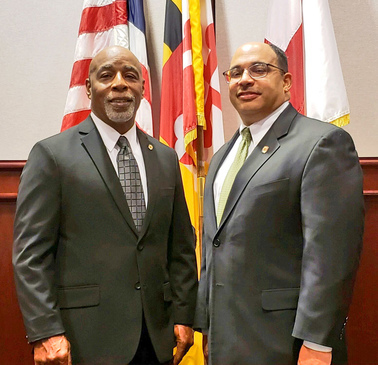 Council Member Todd Turner (D) - District 4, and Council Member Rodney Streeter (D) – District 7 will serve as Council Chair and Vice-Chair respectively, for Legislative Year 2019. They will serve in Council leadership through December 3, 2019. County Executive Angela Alsobrooks was present for the Gavel Exchange Ceremony and addressed the new Council. Chair Turner, upon accepting the Council’s Gavel of Leadership, pledged to be a “bridge builder” during his leadership term, and compared the 11-member Council to a winning football team. A resident of the City of Bowie, Chair Turner was reelected to serve a second four-year term on the County Council, in the November 2018 General Election. Vice Chair Streeter, of Hillcrest Heights, is serving his first term on the County Council. The Prince George’s County Council is now in its December recess. Please have a safe and happy holiday season!